Julia Pardoe (1804-62) was famous for her historical biographies (some of which are also reissued in the Cambridge Library Collection), but this two-volume work, first published in 1837, arose from a visit to Turkey made by Pardoe and her father in 1836. It was very successful, with new editions appearing over the next twenty years, while Pardoe was considered to be second only to Lady Mary Wortley Montagu among female writers on Turkey. 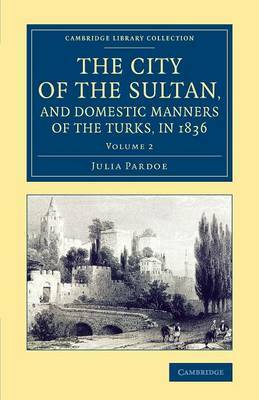 Attempting to give her readers 'a more just and complete insight into Turkish domestic life, than they have hitherto been enabled to obtain', in Volume 2 Pardoe travels in western Turkey, visiting Bursa, the former Ottoman capital, and encountering dervishes, hot springs and tortoises, before returning to Europe via the Black Sea and the Danube. Her lively and observant account of life in the declining but still powerful Ottoman empire remains of great interest.